Posted by Telangana Utsav in Articles, Bonalu, Culture, Essays, fairs and festivals, Telangana Festivals. Artist Vidyasagar Lakka’s photo exhibition titled ‘The Telangana State Festival of Goddess Kali worship’ is an attempt to promote Bonalu festival to different cross-section of people. HYDERABAD : Artist Vidyasagar Lakka’s photo exhibition titled ‘The Telangana State Festival of Goddess Kali worship’ is an attempt to promote Bonalu festival to different cross-section of people. The ongoing exhibition (9.30 am to 8 pm) at Alliance Française Gallery, Banjara Hills is a solo show being organised with support of Alliance Francaise Hyderabad and Telangana Tourism has evoked interest in art patrons and aims to provide information about this festival well in advance this year, to provide information on how it is celebrated and the rituals involved, so that enthusiasts can celebrate the festival which falls in the Ashadam month (July –August). The photographs speak about keeping alive the rich Telangana heritage and culture through this thematic art exhibition. A photography workshop and guided tours for photographers (with help from Telangana Tourism Department) have also been planned. The exhibition ends on May 13. Embracing the motto ‘show, don’t tell’, the author’s camera becomes a tool for accurate capture of the visual experience of BONALU, and for the faithful dissemination of his impressions across India and the world. This is, therefore, a result of the author’s passion for the realistic preservation of India’s local cultures and traditions through his photography. 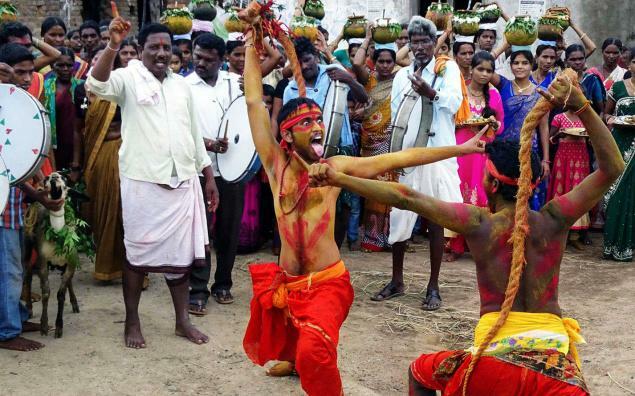 It takes you on a tour of Bonalu, revealing the colour, the excitement, the energy and the unforgettable feel of the spectacle that unfolds in the streets of Hyderabad. Vidyasagar is an alumnus of JNTU Fine Arts Photography and Hyderabad Central University. He has a post-graduate diploma in TV Production, and is currently working as a Photo officer at International Crops Research Institute for the Semi-Arid Tropics (ICRISAT) where photography is not just a means of documentation and communication but also a tool of research of the ‘cosmos’ of the plant world. Posted by Telangana Utsav in Bonalu, Culture, Identity, Warangal. 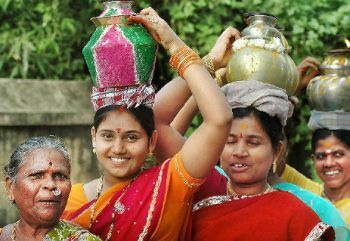 Religious fervour: Women with ‘Bonalu’ at the Beeranna temple in Warangal on Sunday. Posted by Telangana Utsav in Bathukamma, Bonalu, English, In News, Telangana. వైవిద్య రాగాల వీణ – తెలంగాణ : Cover story of Sunday ‘Vaartha’ (16 September 2007) is an example of plagiarism, sadly that is widespread in Telugu writing. It is a good story. But not done in right way. The cover story of eight pages (page 12 to 19) is a picturesque tale with photos taken from ‘Spirit of Telangana 2007’ Calendar and TUC website. ‘Vaartha’ cover story has all its pictures – eight pictures on the cover from Utsav. And eight page story has fifteen more pictures depicting culture and monuments of varied districts of Telangana. NO MENTION WAS MADE OF THE SOURCE OF THESE 23 PICTURES THAT MADE THE ‘VAARTHA’ STORY!